From glimpses of a new Instagram Quiz Sticker and Safer Internet Day. To Snapchat’s success making a comeback and Influencer Marketing debacles. Instagram was caught experimenting with Quiz Stickers. As reported on Jane Manchun Wong’s Twitter account, we saw a sneak peek for what the tool will look like. 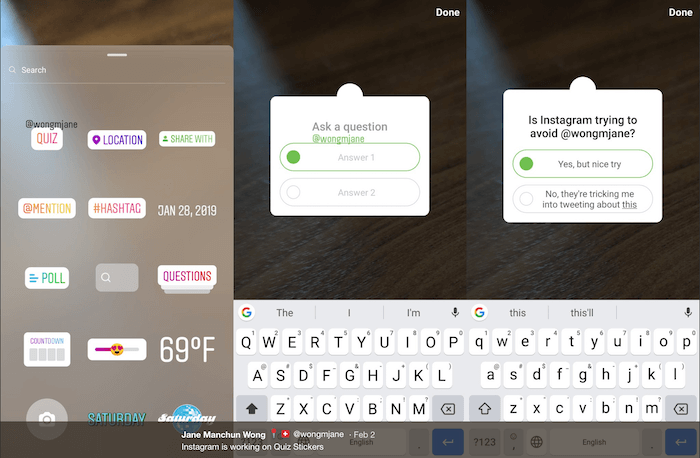 The quiz feature appears to differ from the active Poll feature on Instagram. More specifically, people who submit answers can also see which option is correct. Tuesday, February 5th marked this year’s Safer Internet Day. And in good form, many platforms took to their news centres to share their efforts. Instagram’s newsroom outlined key ways to make your (and your client’s) Instagram accounts safer. As part of this year’s theme, “together for a better internet,” here’s a gentle reminder for account safety. 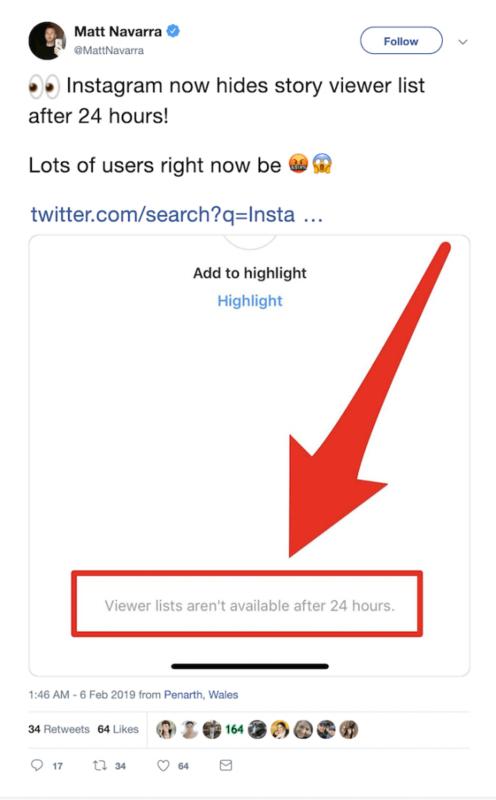 Twitter’s blog also reported the success of their new signal options. This has lead to fewer abuse reports. Similarly, new policies have addressed fake accounts and lower hacker levels. Social Media Guru, Matt Navarra took to Twitter to announce his recent findings on Instagram Stories. As a key metric to use when measuring Instagram Story engagement, viewers lists are important. 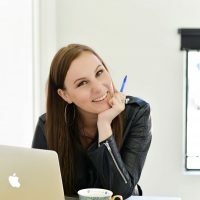 Without them, it will also be tricky to see who’s coming back to your content for more. Twitter users remarked that this was not at all okay. And flooding comments resonated with the same remarks. While this new update hasn’t rolled out across all accounts yet, we recommend keeping an eye on your Story analytics while they last. This week Kitco reported on Ralph Lauren’s interesting influencer campaigns that increased the account’s followers by 1.6 million in the last 3 months. The mega-brand teamed with key influencers such as Taylor Hill of Victoria’s Secret. 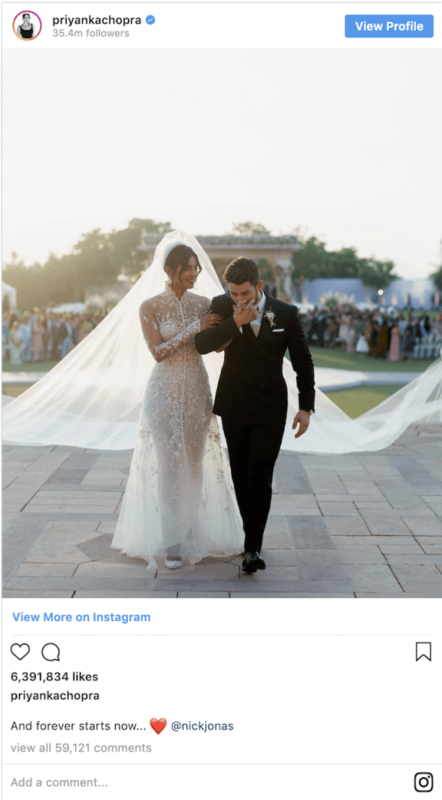 As well as the wedding of “Quantico” celebrity Priyanka Chopra and Nick Jonas. Ralph Lauren’s Chief Executive Officer Patrice Louvet reported that such campaigns resulted in more sales of Ralph Lauren coats, shirts and accessories. Influencer Marketing certainly isn’t dead – but choosing your figures, timing and content wisely is a must. While your brand may not have access to high profile celebrities, are you making use of ones within your grasp? In other news, the World Record Egg has made headlines yet again. PR Week announced that Hulu had acquired the first branded spot with the Instagram profile for an undisclosed figure. Despite rumours, Jerry Media (the marketing agency behind the blunderous Fyre Festival) was working to purchase the account for Need to Impeach. Cashing in on the account’s huge 10 million fan audience, Hulu shared a teaser on the channel. It was later revealed that Hulu was promoting their new live sports subscription. 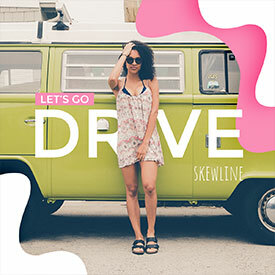 Cleverly launched just before The Super Bowl, it’s evident that the brand understands the power of social media today. 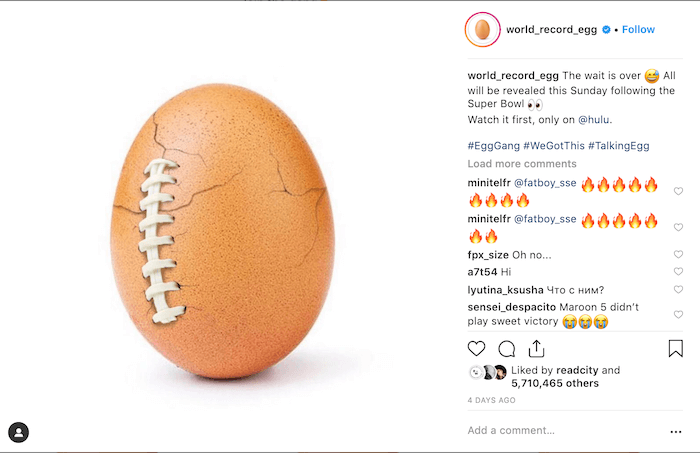 A second post launched a mental health campaign directing viewers to the Talking Egg website. 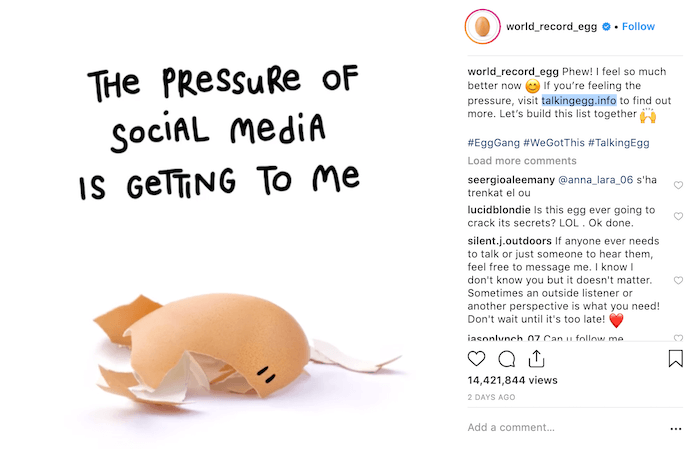 Through an animated video, the egg spread news about social media pressure. And directed anyone having any issues to seek out help from one of the many mental health links on the website. Sure, it’s a positive message. But since the account first launched to tip Kylie Jenner off her 18 million like perch, it does seem a little contradictory. U.S company, Devumi had been under investigation following a controversial New York Times article. And on Wednesday New York Attorney General Letitia James announced that they had settled on an agreement. 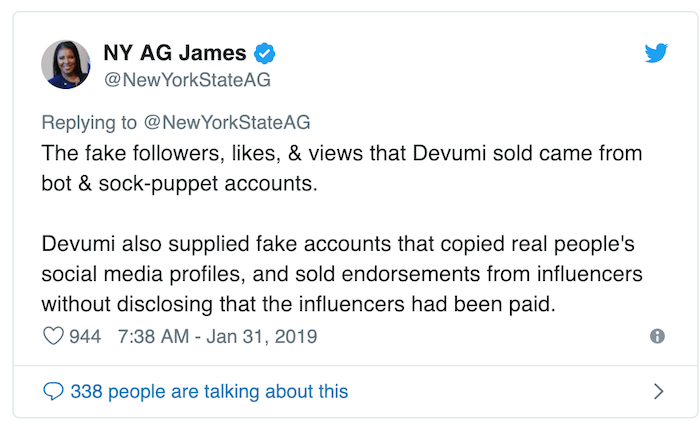 As reported by Mashable, this makes selling fake likes and followers against the law. This is a huge move by the government and acts as a new type of restriction on dodgy accounts. This stance will work to pave the way for other regions banning bots. Let’s see who follows suit next. This follows a slew of celebrity endorsements. The likes of Kim Kardashian, Katie Price and Geordie Shore star, Vicky Pattison have all recently promoted weight loss supplements such as Boombod and Bootea. As controversies continue to rise around the topic of Influencer Marketing, it’s important that businesses using such forms of advertising keep an eye on any new regulations in their industry. A note to those with a younger demographic of ideal customers. Branded Snapchat Lenses could be exactly where you need to be. 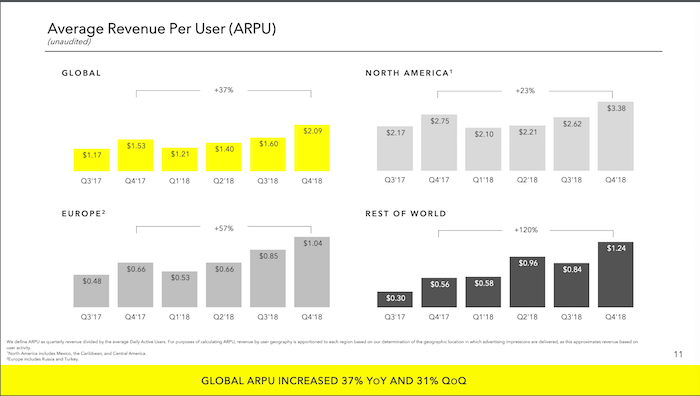 Most impressively, as reported by TechCrunch, is the comeback of Snapchat’s success. This week we brought you our honest opinions on the Fyre Festival debacle. It seems quite fitting that during a week wrought with Influencer outrage, this article hit your screens. Everything from what went wrong to what we can learn from the #epicfail is in there. We also shared insights into the power of brand storytelling on social media. 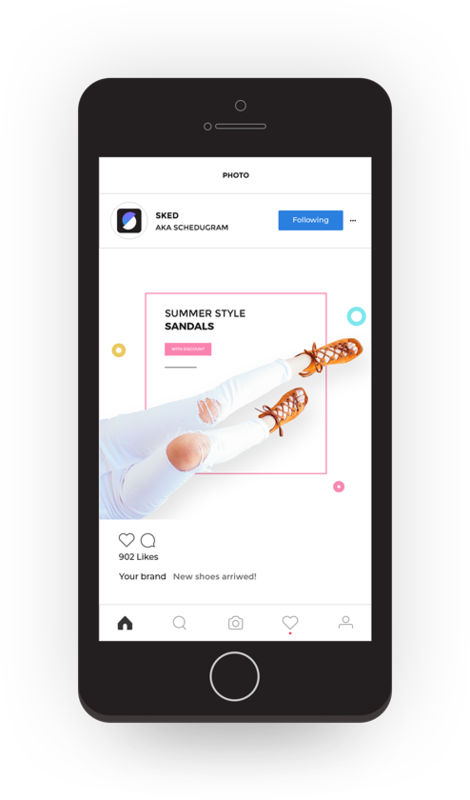 By highlighting ten brands killing it on socials, the piece brings you new and exciting inspiration for future campaigns in your field.